All of the puzzles and games produced by ThinkFun have one thing in common: learning through play. Whether you’re solving logic problems with lasers, creating unique patterns with color wheels, or deducing the culprit of a feline crime, you’re learning valuable skills through puzzling. 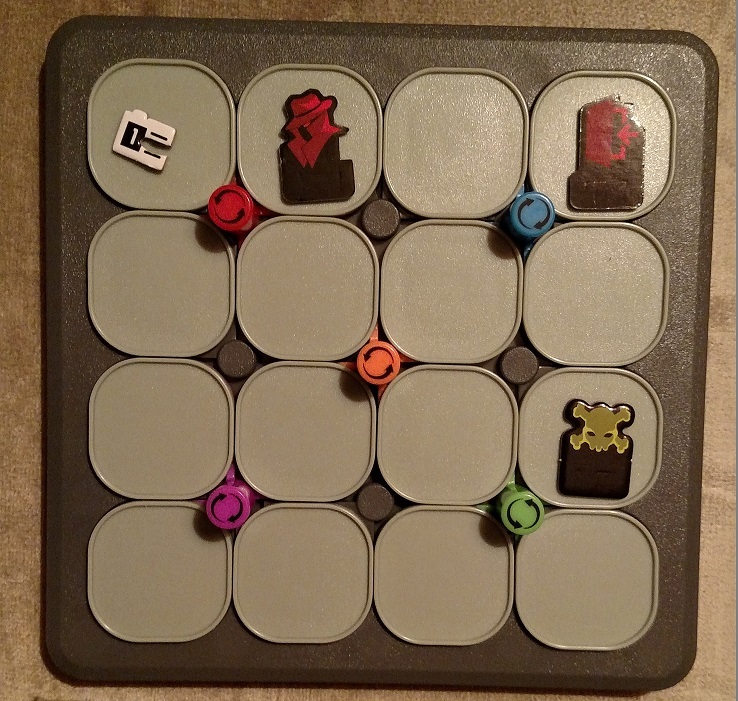 Several ThinkFun games are designed with computer coding in mind, as the gameplay mimics some of the rudimentary concepts of preparing and entering commands, then seeing how those commands can interact with an environment. If you’re familiar with Robot Turtles, or any of their puzzle games from the //Code series, like On the Brink, you’ve already experienced this for yourself or seen someone else putting newfound puzzly skills to the test. But Hacker offers a new twist on this concept. As ThinkFun’s newest logic game, Hacker goes above and beyond those introductory coding games, challenging players to add their own coding to an established scenario in order to complete a specific task. Then the players have to locate vulnerabilities and correct them before they can move on to the next challenge. 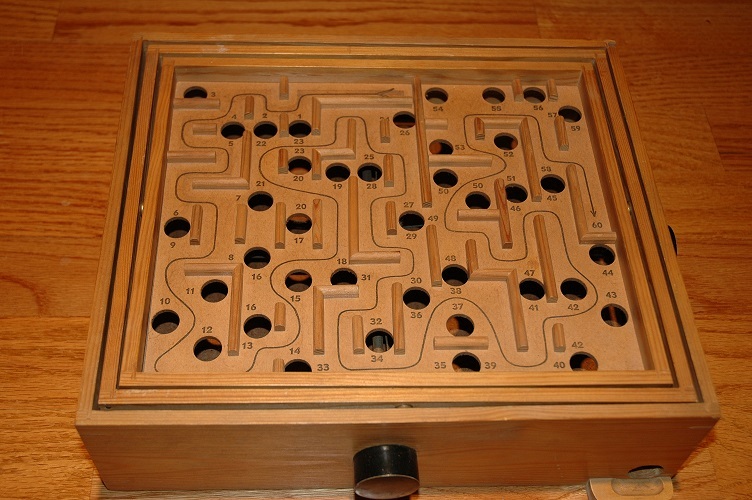 But by working your way through the various difficulty levels — Beginner, Intermediate, Advanced, and Expert — the game introduces new elements and challenges to the player gradually, allowing younger solvers to develop their skills and learn new tricks as they work out increasingly complex scenarios. Let’s look at one Intermediate-level challenge to give you a better idea of how the game works. The first part of each challenge is the coding. 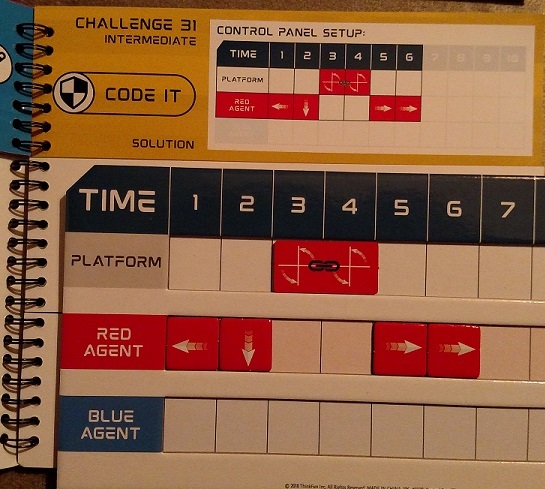 Each challenge card presents you with the initial layout of the grid, as well as which commands are hard-coded into the scenario (listed on the Platform line), and the openings for you to code movements for your agent (shaded in on the Red Agent line). In this scenario, the agent must retrieve a single data file and deliver it to the exit point. You will use the arrow tiles to indicate where you want the agent to move. The rotation tiles are hard-programmed at certain times, so you can’t move them; you have to plot your path and code your agent to take advantage of those rotation commands. 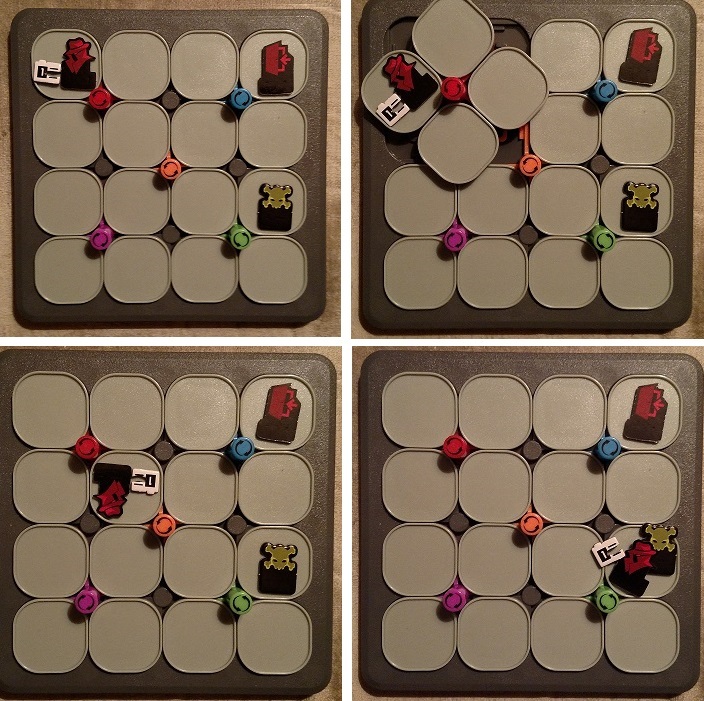 As the scenarios grow more complex, those hard-coded rotation tiles will offer greater challenges, forcing you to become more creative and more tactical in your programming. In addition to handling the rotation tiles, you must pick up the data file and reach the exit point while avoiding any contact with the virus. 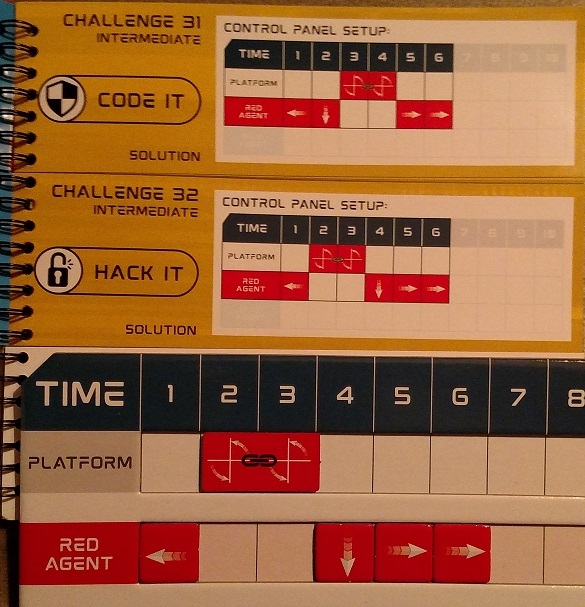 And by using the special answer flipbook — which separates each challenge into three different pages for Code It, Hack It, and Fix It, so you can look at each individually without spoiling the rest of the solve — we can confirm our coding is correct. 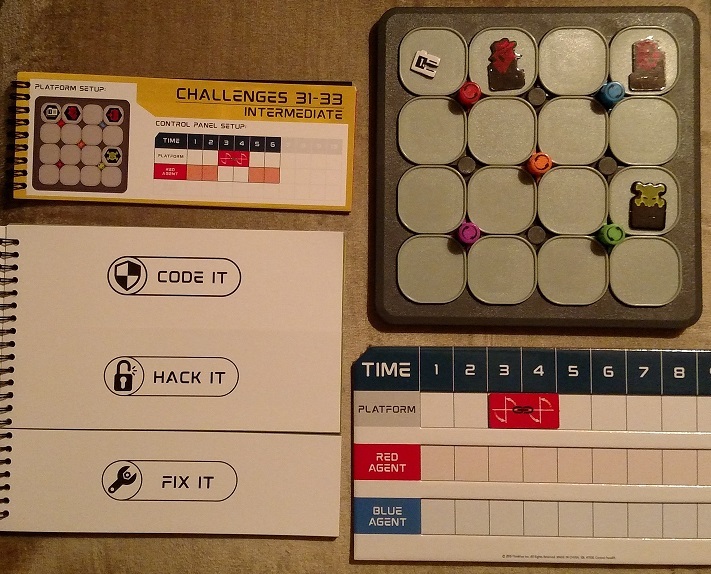 The second part of the challenge is an element I haven’t seen in any previous ThinkFun release: hacking. In this stage, you’re trying to debug your coding by seeking out vulnerabilities in the code that would allow the agent to encounter a virus. You’re essentially troubleshooting yourself! To do so, you have to play the role of a malicious hacker hell-bent on corrupting your coding and delivering the agent directly into the hands of the virus. 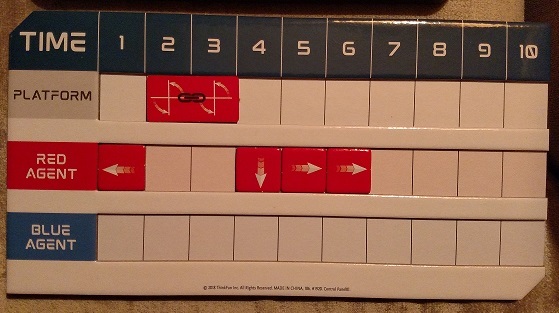 This part of the game is more like a traditional sliding-tile puzzle, as you try to manipulate the tiles already in place to engineer a different outcome. In this case, I’ve moved the platform command forward and the down movement command over, altering the agent’s path. As you can see here, by “hacking” our code, we picked up the data file and delivered it right to the virus, corrupting the entire program. Although our original program avoided the virus entirely, it isn’t safeguarded against hacking. Yet. That brings us to the third part of the challenge, fixing, which allows you to correct the flaws you identified in the second part. You can do so by placing an alarm on an open tile, which prevents the agent from encountering the virus; but you must do so without interfering with the successful completion of the original coding’s goal. In more difficult scenarios, you can also fix your coding by using a link token to link certain commands together, so a hacker has to move them as a whole, rather than as individual commands. So in order to have a successful fix, you should be able to play through the original coding and succeed, but the hacked coding should be thwarted by the changes you’ve made. It’s an effective metaphor for the amount of review and beta-testing that goes into actual coding, since tiny mistakes can have dire consequences. By requiring younger players to review the same data in three different ways, you’re subconsciously encouraging diligence and care in one’s programming. It’s a simple lesson, but an important one, and the gameplay promotes it without feeling preachy or heavy-handed. Instead, you’re almost partners-in-crime with the game as you develop new tricks to outwit each scenario. 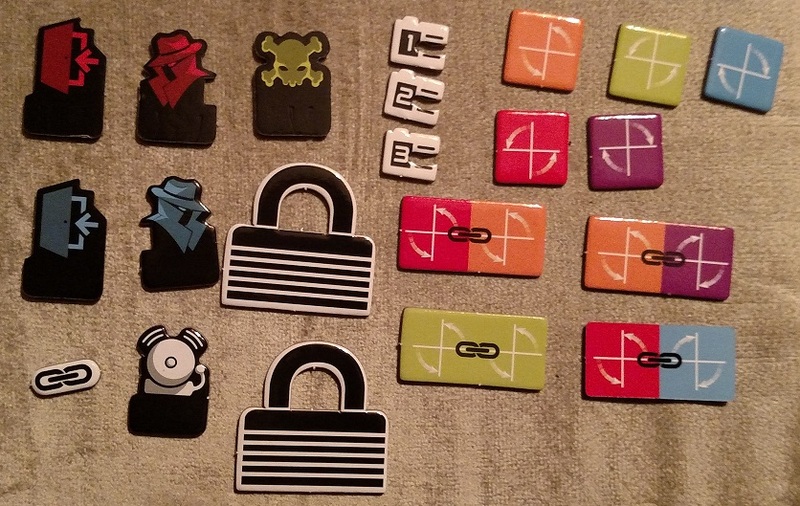 Hacker is one of ThinkFun’s most complex and immerse logic games yet, one that never forgets to be great fun and an engaging, multilayered puzzly challenge, even as it educates. Other ThinkFun games might look flashier at first glance, but I think they’ve truly outdone themselves this time around. 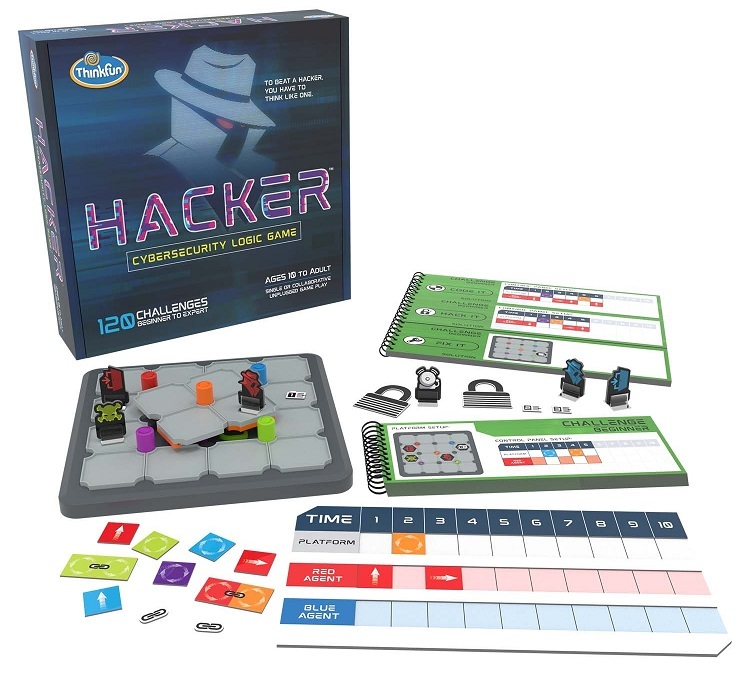 Hacker is available from ThinkFun and participating retailers, starting at $24.99. ThinkFun has emerged as the premiere vendor of logic puzzles for solvers of all ages. Whether they’re challenging you with marbles, lasers, or electronic circuits, their complete-the-path games offer lots of puzzly fun. Their latest offering, Lunar Landing, seems at first to fall into the same pattern, but as you learn the rules and begin tackling the challenge cards included, you quickly realize there’s more than meets the eye at play. 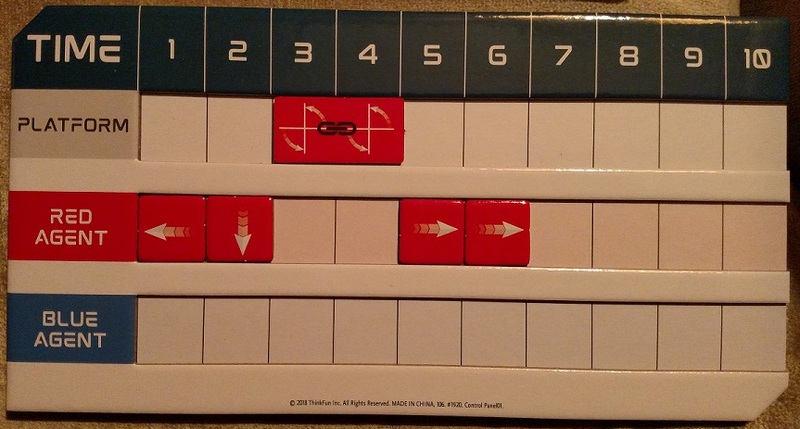 In Lunar Landing, your goal is to pilot the red shuttle to an emergency entry port in the center of the landing grid. Sounds easy enough, right? But the twist is how you get there. Scattered across the landing field are helper bots which help your shuttle move around the landing field. The shuttle can only move toward one of the helper bots in the same row or column. The shuttle must move from helper bot to helper bot until it reaches the emergency entry port. Because Lunar Landing is set in space, the shuttle can’t just stop wherever it chooses. Once the shuttle is set on a path toward a helper bot, it continues along that path until it reaches that bot. This means you can pass right over the emergency entry port unless there’s a helper bot in the correct position to stop the shuttle on that red square. This movement mechanism is the engine behind each of the 40 challenge cards in the deck. Progressing in increasing difficulty from beginner to intermediate to advanced to expert, the challenge cards provide you with the starting layouts for each landing grid. You place the shuttle and helper bots as instructed, and then try to puzzle out how to complete the task at hand. The early scenarios are all about moving the shuttle from place to place. In later challenges, you’ll have to move the helper bots as well, positioning them to form a path that’ll bounce your shuttle to the center of the grid. The helper bots move in the same way as the shuttle — toward another helper bot along a row or column — and as the scenarios evolve, you’ll rely on moving the helper bots more and more. It’s a bit like a sliding-tile puzzle, since you can only move the shuttle along certain paths, as determined by the locations of the helper bots. Many of the challenge cards can only be conquered by setting up a chain reaction, which gives Lunar Landing the feeling of a one-person chess game: You’re trying to see several moves ahead, looking for the perfect sequence of moves that will let you achieve victory. Taking a simple scientific concept — objects in motion tend to stay in motion — and building a logic game around it is very clever, and it makes for a solving experience that feels new and challenging. Since each piece can potentially move, depending on the challenge card layout, there are more variables at play here than in previous ThinkFun logic puzzles. The helper bots are modeled on classic robot designs from the 1940s and 1950s, and that adds to the game’s charm, as if the vivid Technicolor visions that predated the Space Race have finally been realized. The landing grid doubles as storage for the challenge cards and game pieces, making for an easily transported puzzle game that can be enjoyed anywhere at the drop of a hat. Lunar Landing continues the fine tradition of ThinkFun puzzle games, keeping even experienced puzzlers on their toes with inventive gameplay and outside-the-box thinking. What a treat. Lunar Landing is available from ThinkFun through Amazon and other online retailers. Click here to check out other ThinkFun product reviews! 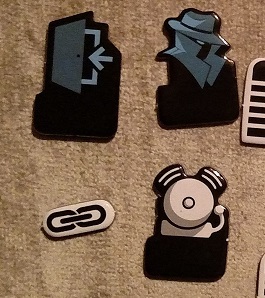 Imagine someone hands you a small puzzle game. You twist and turn it this way and that way, trying to line up all the different colored components so that they match, spinning and manipulating it so that one particular piece falls into place, but by doing so, three others end up somewhere else, and now you have to chase them down. It probably sounds like I’m describing solving a Rubik’s Cube, but the same description fits cracking the latest puzzle game from ThinkFun: Back Spin. And you know what? Back Spin is the younger sibling of the Rubik’s Cube that I wish I could’ve tried out first. Designed for solvers aged 8 and up, Back Spin only features two sides (front and back) to Rubik’s six, but each of those sides has six small colored chambers, intended to hold matching colored spheres. Rotating the front or the back allows you to line up these chambers and swap spheres between them. As for the spheres, there are nine different colors to sort; red, yellow, and orange are on both sides, but each side has a different shade of blue, green, and pink/purple, meaning some spheres can go on either side, but some are only meant for the front or the back. 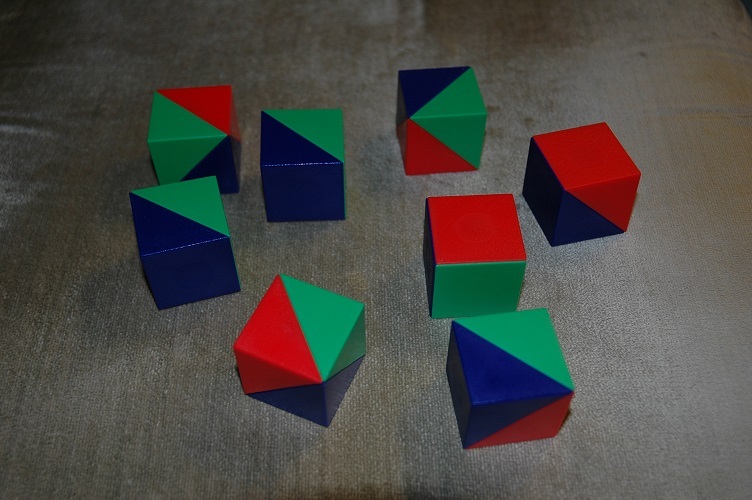 Whether you’re moving colored spheres from back to front or rotating them in overlapping chambers to shift the spheres’ positions within the chamber — a la the sliding tiles in one of those picture puzzles — this is an introduction to chain-thinking and solving, a step up from simpler mechanical brain teasers, but not nearly as daunting as Rubik’s infamous cube. [Alright, it’s solved! Oh, no, wait, this is only one side. Darn. 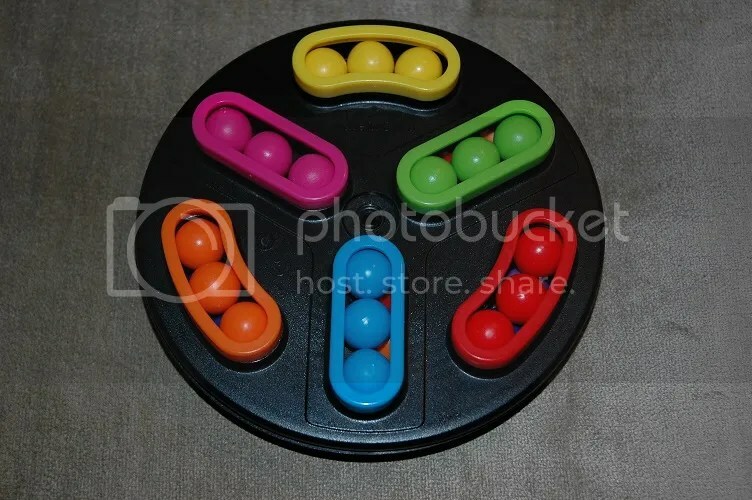 And although the game is marketed as a single-solver puzzle, you really need two: one to mix all of the spheres up, and the other to unravel it. It’s much more satisfying to conquer the challenge someone else sets out for you than one you set for yourself, because you can’t help but retain some of the steps involved in mixing up the puzzle. Having someone else mix up the spheres not only allows for a tougher solve, but the process of mixing them up for another solver is just as valuable a puzzling experience as solving it. [Okay, this time I’ve got it. All the spheres properly placed on both sides. Phew! Back Spin is a wonderfully vivid variation on a classic style of puzzle solving, one whose simple mechanics — a wheel that goes back and forth and holes that line up — allow for deep, meaningful, logic-based puzzling. It encourages exploration and experimentation, staving off both the boredom and the frustration that more difficult brain teasers often spark. It’s a terrific addition to the ThinkFun line-up of puzzle games that teach while you play. 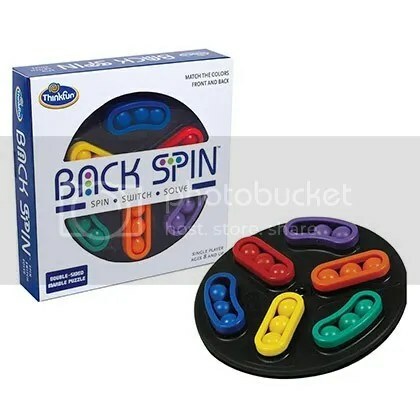 Back Spin is available for $14.99 on the ThinkFun website. To check out previous ThinkFun product reviews on PuzzleNation Blog, click here. Most of the time when I write about puzzles, I write about humans solving them, because we are, by a long shot, the biggest consumers of puzzles and games in the world. But, from time to time, I learn about other species that also have a knack for solving puzzles, and I welcome them to the puzzle-solving community. In the past, we’ve talked about crows, cockatoos, and octopuses solving various mechanical puzzles. And then a friend of the blog brought another puzzle-solving species to my attention: dogs! I shouldn’t have been surprised by this. 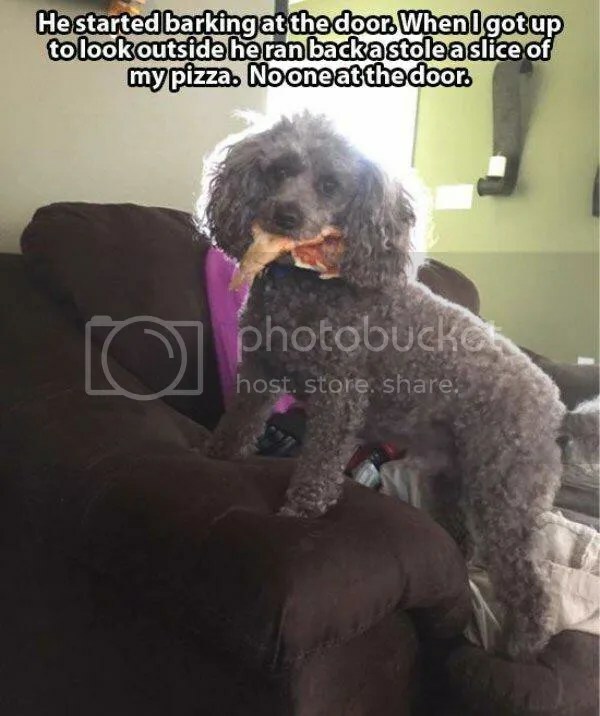 After all, one of my dogs has a knack for getting his tennis ball stuck in the strangest corners and beneath furniture that shouldn’t allow a tennis ball at all! So I did a little research, and it turns out, there’s an entire puzzle-solving industry devoted entirely to dogs. They’re almost exclusively mechanical puzzles with food rewards, just like the puzzles we’ve seen birds and octopuses solve, but they involve the same sort of step-by-step chain puzzle-solving. And some of it gets pretty complicated! 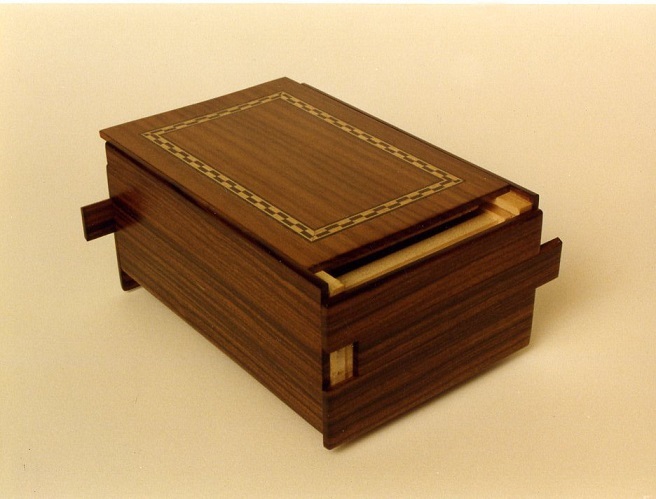 There are one-step devices, like the Trixie Dog Activity Poker Box, which involves four boxes that open in different ways. There are two-step devices, like the Jigsaw Glider, which requires the dog to open pieces on either side and then shift the center piece back and forth in order to nab every treat inside. 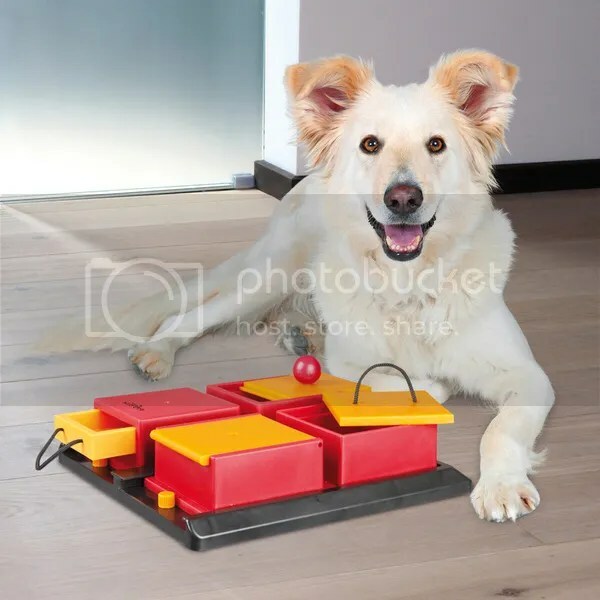 In a similar vein, there’s the Doggy Brain Train 2-in-1, a food-centric version of a sliding tile puzzle, where the dog must deduce that there’s food beneath each disk, and slide the disks aside to acquire the treats beneath. And the puzzles only grow more complex from there. 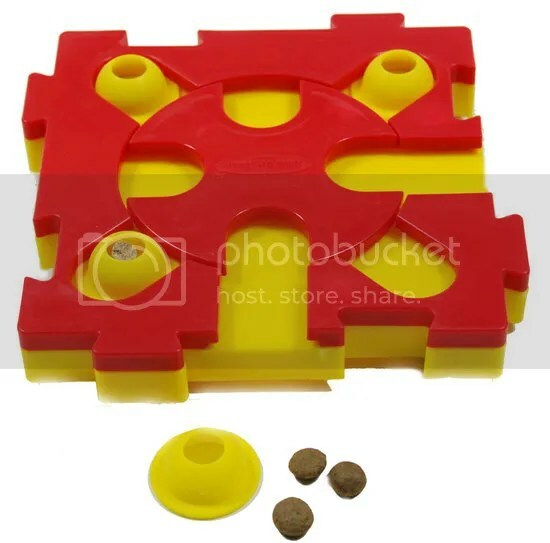 In the Dog Activity Gambling Tower, the dog has to pull away three floor pieces in order to make the treats drop, like a snacky version of Ker-Plunk. Various companies produce each of these products. 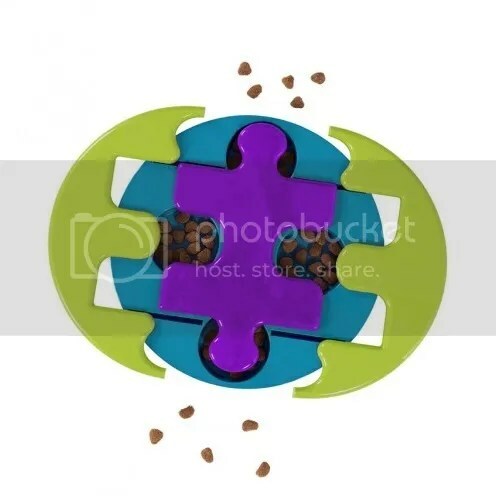 But the queen of puppy puzzles is clearly Nina Ottosson, who has a fleet of food-puzzle products to put your puppy to the test. 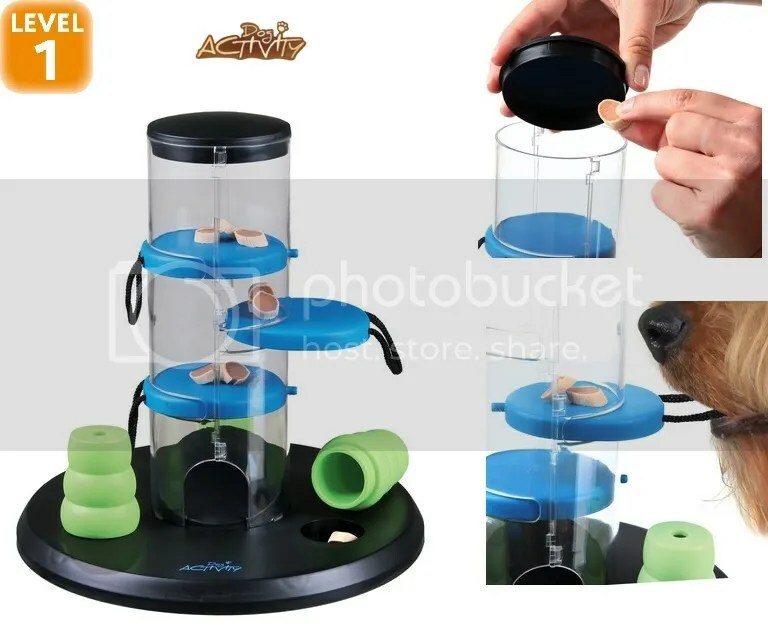 It’s the second difficulty level in a series of toys, where the dog has to rotate the center piece, push out one of the cones (with treats inside), rotate the piece again, and finally free the cone and the treats. 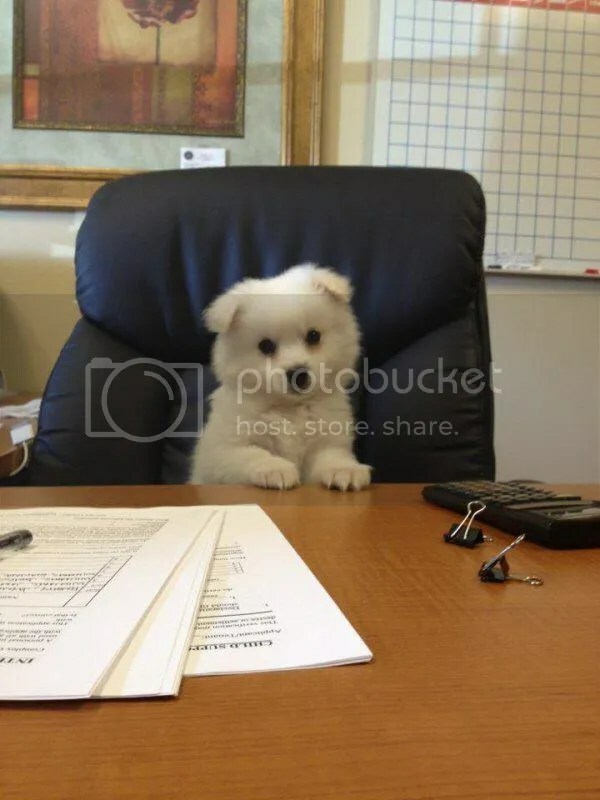 That is a LOT of work for a few treats. 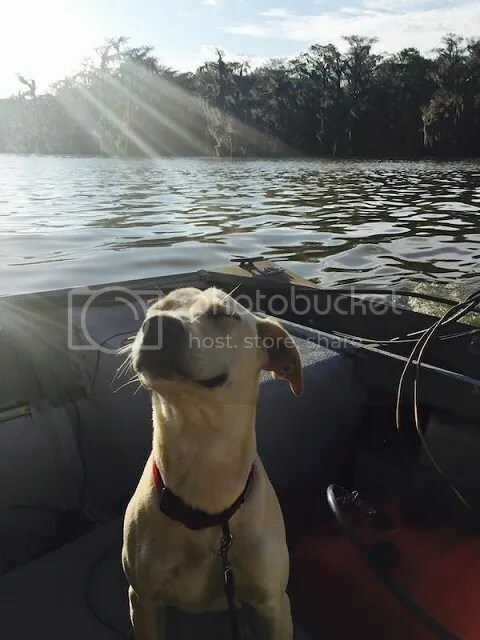 We can officially add dogs to the elite puzzle-solving ranks of crows, cockatoos, octopuses, and humans, though I must admit, it’s a little embarrassing to realize that those other four species are all smart enough to do their own puzzle-solving for treats. No one ever gives me a treat for solving a puzzle. Hmmm. Maybe they’re even smarter than we thought. 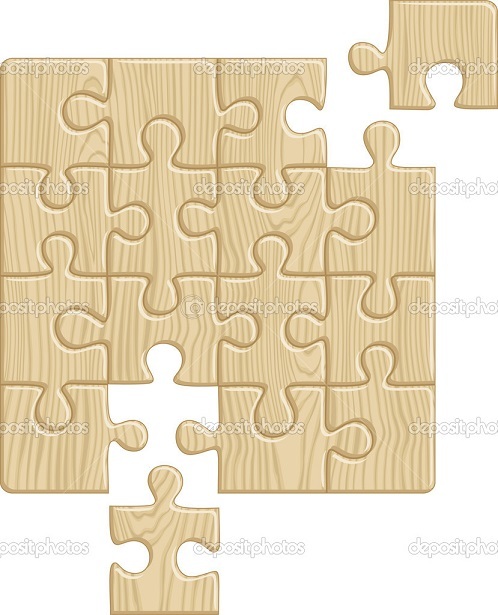 The World of Wooden Puzzles! Puzzles come in all shapes and sizes, adopting numerous forms that challenge the mind in seemingly endless ways. 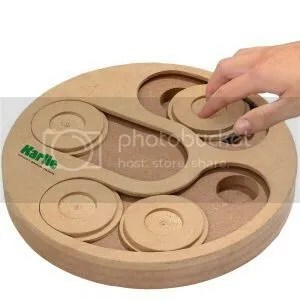 While I spend a lot of time on PuzzleNation Blog talking about pen-and-paper puzzles (and their electronic siblings), today I’d like to focus on a brand of physical puzzles: ones made of wood! 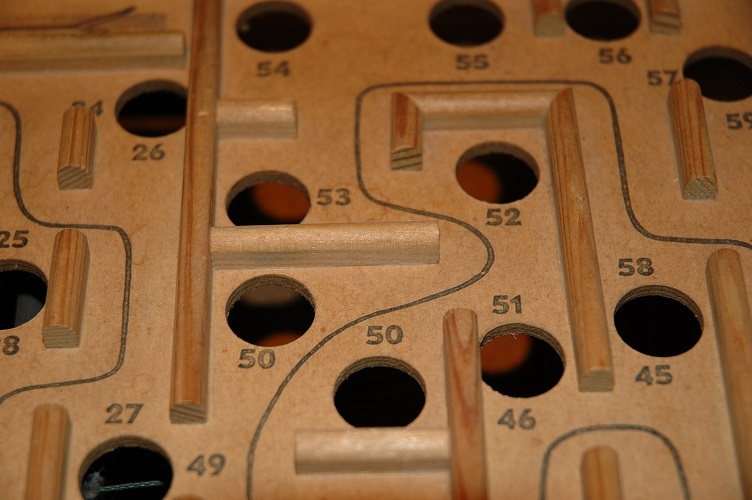 As you’d expect, there are hundreds of different puzzles to choose from when discussing wooden puzzles, but I’ve tried to narrow the field down to a manageable size. Enough chatter, let’s get to it! 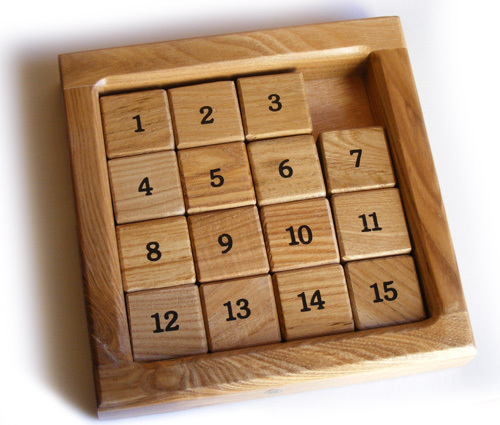 One of the oldest varieties of physical puzzles, sliding tile puzzles can be found in plastic, electronic, and wooden forms. And whether you’re shifting pieces in order to create a picture or pushing tiles around in order to put numbers in a specific order, the chain-solving technique is the same. A tactile and intuitive brand of puzzling, tangrams are a staple of the wooden puzzle market, utilizing simple geometric shapes in order to match designs or fit the pieces into a given space, as in the image above. These beautiful and elegant puzzles involve a level of craftsmanship and attention to detail that goes far beyond the usual mechanical puzzle experience. 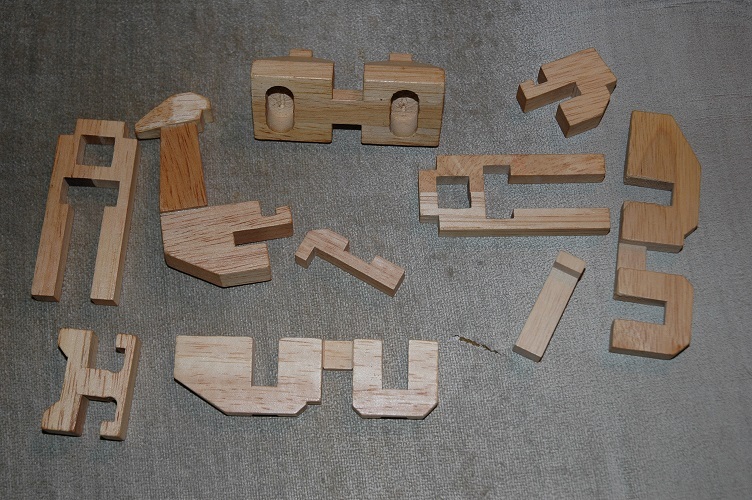 Sometimes, you’re figuring out how to disassemble a shape into its component pieces (six examples of this sort of puzzle-solving appear above), while in others, you have to remove a given piece from a more complex arrangement, often involving ropes and other obstacles that interact with the wooden puzzle itself. Everyone knows the goal of a maze or labyrinth: to get through it with as few wrong turns as possible. But when you have to navigate a steel ball through the labyrinth without falling into one of many pits, that becomes an even greater challenge. Whether you’re using handles to manipulate the maze and allow gravity to shift the ball from point to point or turning the labyrinth this way and that in order to move the ball toward the finish line, your dexterity and patience are sure to be pushed to the limit. 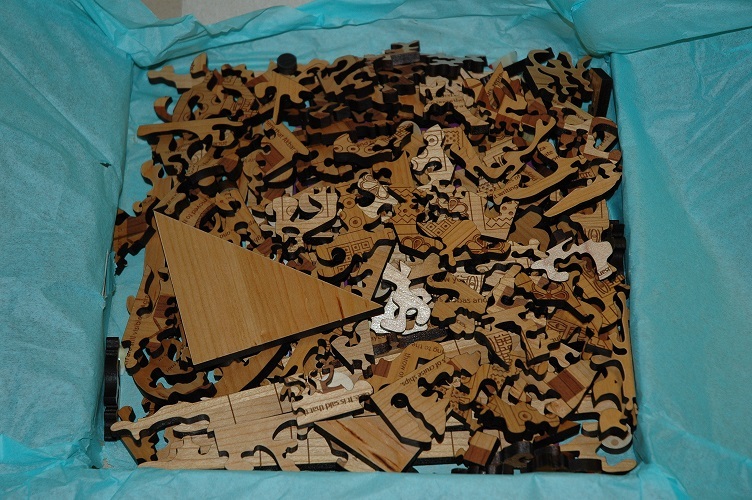 I would be remiss if I ignored the most common variety of wooden puzzle: the jigsaw puzzle! Whether we’re talking about the more traditional shapes in a Ravensburger puzzle or a jigsaw incorporating unique and interesting pieces like those produced by Wentworth or our friend Rachel Happen of Baffledazzle (like the ones pictured below), jigsaw puzzles are among the first puzzles to which a young child is exposed. Of course, despite the many tough jigsaw puzzles available these days, you might be looking for a jigsaw with an additional dimension of difficulty. Thankfully, there are 3-D puzzles to give your spatial reasoning a run for its money! Both the dragon at the top of the page and the camel pictured above are 3-D puzzles that were sent to me by the lovely Sara Kingsland, owner of Completely Puzzled in Port Townsend, Oregon. Believe it or not, I solved the dragon before the camel! This is because the puzzles involve different approaches. 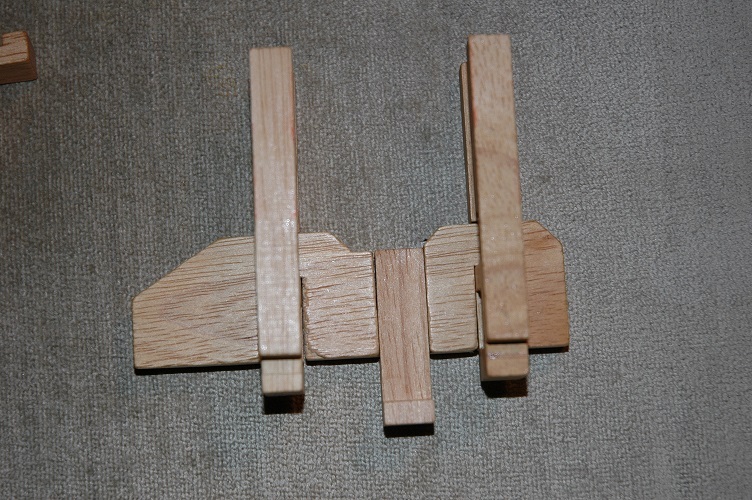 The dragon was designed to be assembled from tail to head, and rarely required me to hold more than two pieces at a time to continue solving it. 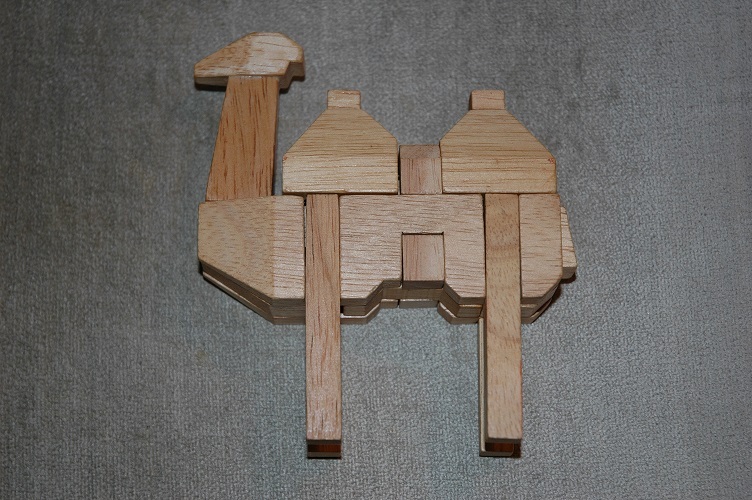 The camel, on the other hand, has to be solved legs first, which means holding numerous pieces in place while manipulating others in order for everything to come together. With the advent of laser printing, the sky is truly the limit when it comes to imagining new and challenging wooden puzzles. I can’t wait to see what these wickedly brilliant puzzlers come up with next. 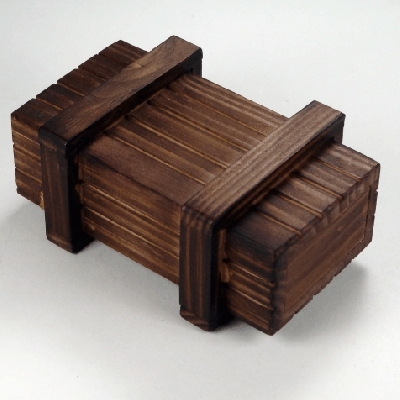 Are there any types of wooden puzzle I missed, fellow puzzlers and PuzzleNationers? Let me know! (Other than Scrabble, that is. I left that one off the list intentionally.) And while you’re at it, tell me what your favorite kind of wooden puzzle is! The folks at Brainwright specialize in puzzles intended for younger solvers, but with enough challenge and style to keep older solvers busy as well. From curiously cut jigsaws to color-based deduction puzzles, they take classic puzzle concepts and add their own curious spin to create new puzzle experiences. They offered us the chance to try out two of their puzzles for the younger puzzling set, and we put them to the full PuzzleNation Blog test. Collide-O-Cube looks simple — after all, it’s just eight identical multicolored blocks — but plenty of great puzzles appear simple, yet offer seemingly endless variation and challenges the more you tinker with them. You see, the eight Collide-O-Cube blocks aren’t quite identical. 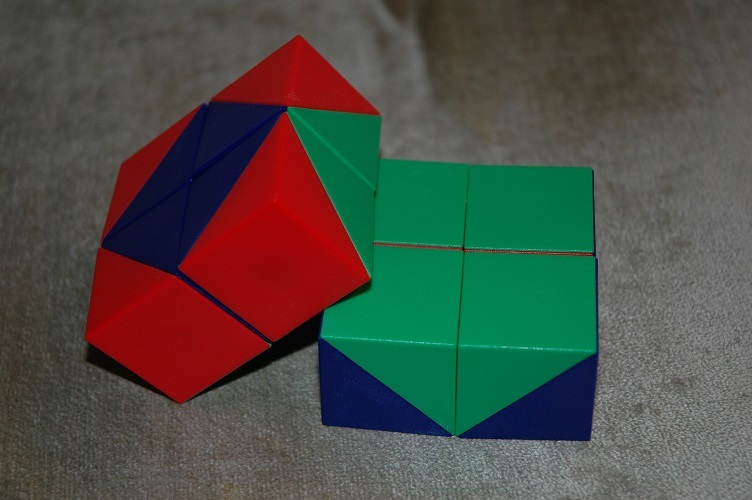 Each one contains a unique pattern of magnets inside that offers another level to the solving process as you try to recreate the several dozen cube patterns in the challenge booklet included. 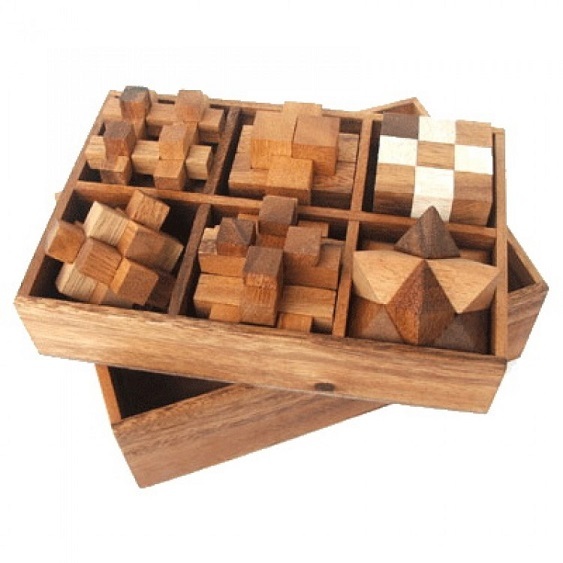 This makes for a curious solving experience that combines pattern recognition, deduction, and patience as you play around with blocks until the solution snaps into place. Although designed for kids ages 8 and up, adults will certainly enjoy fiddling with Collide-O-Cube, and I suspect kids will spend as much time creating their own puzzly patterns and shapes with the blocks as they will solving the various cube puzzles. 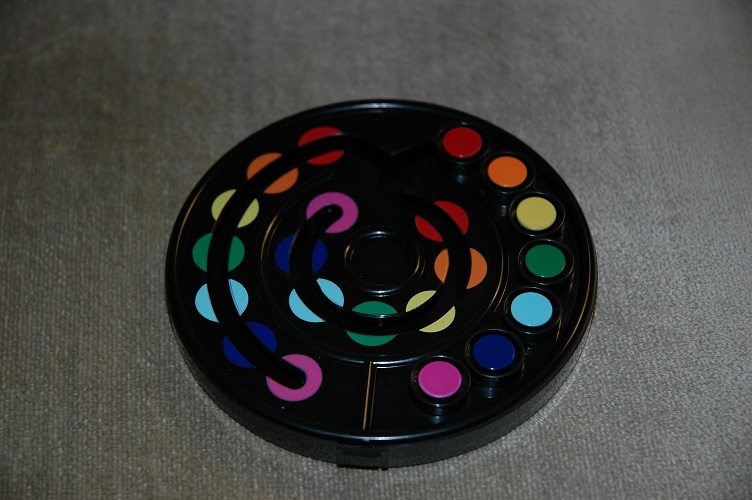 Rudenko’s Disk, on the other hand, is more in the vein of a sliding tile game; a marvelous, colorful, self-contained version of the classic Tower of Hanoi puzzle, Rudenko’s Disk challenges the solver to move various colored posts along the track in order to recreate the color pattern along the side of the disk. Again, this seems simple enough, but Rudenko’s Disk includes a crafty wrinkle to the solving process: each colored post clicks into place when in a spot with a matching color. So, for instance, the orange post can only go as far to the left, right, or center as the orange circle, and no further. You can’t place the orange post on the yellow, the green, the blues, or the purple. But you can place the dark blue post on any circle between dark blue and red. (Only the purple is off-limits for the dark blue post.) 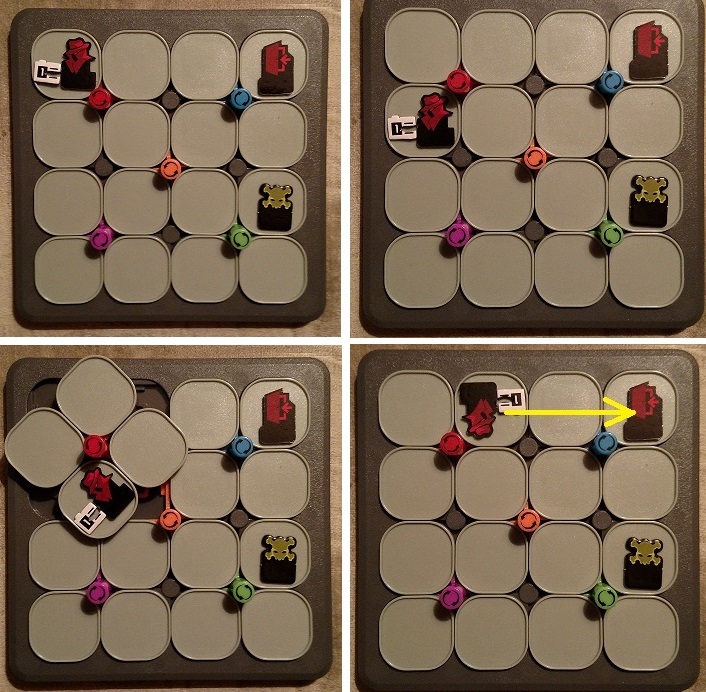 A strategic chain-solving puzzle lurks within the simple sliding mechanic. 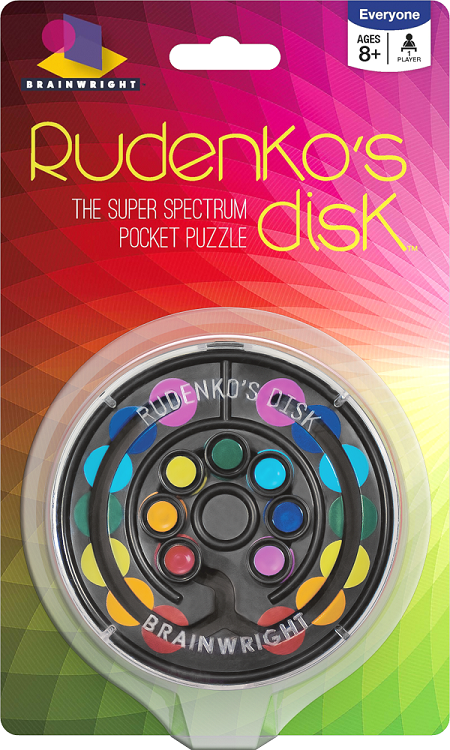 Rudenko’s Disk could be a little off-putting or frustrating for the youngest solvers among us — similar to another color-based puzzle of some renown, Rubik’s Cube, but not nearly as daunting. These are two intriguing examples of color-based puzzles, but they’re very different solving experiences. 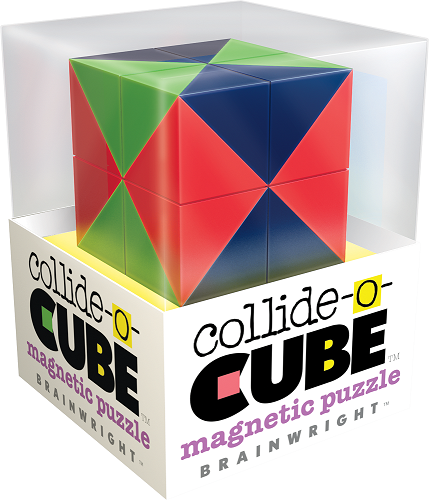 Collide-O-Cube’s hidden magnets add a delightful bit of unexpected randomness and chaos to what would otherwise be a simple pattern-matching game — making for a puzzle that encourages fiddling around the blocks in open play — while Rudenko’s Disk’s rigid mechanics require solvers to be a bit more tactical. But both puzzles are immensely satisfying when the solution clicks into place. I think Brainwright‘s formula of familiar puzzles with new touches and complications is a recipe for continued success and puzzly fun.